If you want a better garage, you can count on Custom Garage Works! Recognized for our custom garage floor coating in Grand Prairie, TX, we originally started our company in 2003. We decided to create the perfect garage for ourselves and our growing families, and when we couldn’t find what we were looking for within the current industry, we decided to jump in ourselves. Now, we provide some of the best garage storage cabinets in the business, as well as high quality polyurea polyaspartic floor coatings that last years longer than traditional epoxy floor coating. Our contractors are professional trained, and we are passionate about creating custom garages, with impressive garage floor coating results across DFW. 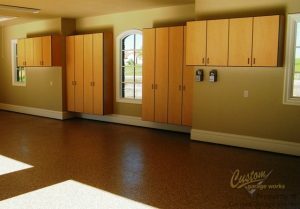 One of our most popular garage services is our garage floor coating in Grand Prairie, TX. This is because by using polyaspartic coatings instead of epoxy, we get a finish that lasts longer and is more durable. Thanks to it’s tough composition, our polyurea-based floor coating is resistant to changing color and flaking that can occur with epoxy. Since we choose to use a diamond grinder to prep the concrete for coating, as opposed to acid etching, we can ensure a higher quality end result. If you’re interested in hearing more about our garage floor coating service, you can schedule your free estimate when you call 214-494-9068 or 817-308-1305. If you are running out of space in your garage, Custom Garage Works has the right garage storage and organization solution for you! 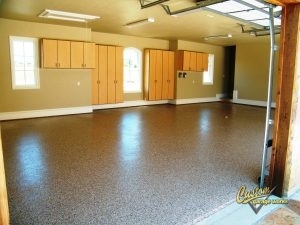 We know your new garage floor coating looks best when it isn’t covered by clutter! To address the unique organizational requirements of our customers, we offer a selection of different organization solutions, including overhead storage racks and cabinets. All of our garage cabinets are secured to the wall for additional safety, and our overhead storage racks are stronger and more dependable than many others you will find on the market. For a dependable garage floor coating in Grand Prairie, TX that will last for year after year, and an organization solution that cannot be beat, you can depend on Custom Garage Works! Car Lifts A residential garage auto lift is easier to use than you may think! And More! We provide a wide variety of garage organization resolutions to our clients, to provide the ultimate custom garage!